Most everyone knows the water here is clear and skinny, excellent for sight casting redfish or targeting trout. 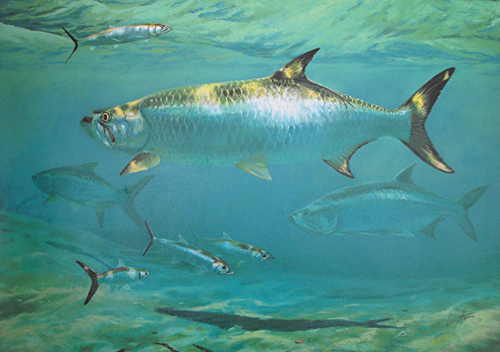 It’s the presence of snook and tarpon in this tropical clime that really piques peoples’ interest nowadays though. The reality is this fishery has great depth in both numbers and variety and can accommodate any fly fishers’ taste. There is plenty of off season access to the beach for easy surf fishing. Come spring break weekend or other high traffic days – just like anywhere else on the map – you better go elsewhere. There is prime surf fishing along the 27 mile stretch between Beach Access 6 and the Port Mansfield Jetties. A beach permit and 4X4 are required for that run. The surf holds three sand bars creating two very fishy guts and the gulf side of the third bar. All should be fished thoroughly unless bait balls, fleeing bait or working birds are spotted. In that case hustle over there and get in on the action because it may not last long. Seagulls are the least of your indicator birds with Pelicans and Terns being your go-to guides. (No offense to any fly fishing guides out there.) When fishing the bait balls, Larry says it’s still blind casting, but blind casting to fish in a barrel. They are there and they are worked up. All the exotics run through here so a full tackle box and cache of clear water tippet and some wire will be needed. Larry has a very confident air about the surf and the jetties in regards to tarpon and other big fish. Listen to him and you would believe any fly angler has a good crack at the big boys. I listen, I want to believe. Each jetty has its own personality and potential. Which jetty will fish better all depends on which way the current is swinging in the channel. If the current is flowing close to the jetty you are on you are in for a good day. Otherwise you are in for a long drive if jetty fishing is the mission for the day. While The north jetty and beach is accessible via Isla Blanca Park (fee required, check Cameron County for current rates) the south jetty must be reached by Boca Chica State Park which is a primitive and undeveloped beach area accessible from Texas Road 4 (check your directions/GPS because many are out of date/inaccurate), but will require driving on the beach (usually 4×4) to reach the jetty. This means fewer two legged predators and more solitude. The north jetty generally offers better fishing because the drop off to deeper water occurs closer to shore allowing predator fish to encroach into the shallow water where jetty and surf anglers can reach them. The Boca Chica Beach has a more gradual slope that extends a good ways out. Port Mansfield Jetties are another good option, but are often crowded. In addition to the tidal flow you are looking for clear water that approaches the beach, periods of strong tidal movement, preferably from the full or new moon and enough wind to effect the water’s surface just short of hampering your vision and casting. You are also looking for anchovies running the shoreline. “We have dusky anchovies here. They have more of a tan brown back than the greenies.” When they are in so are the big boys. In the bays it’s shrimp in the fall and baby fish and minnow varieties in the summer. Bay fishing is a cover lots of water game unless you are really dialed in like Larry. Fish areas/structure inundated with water at high tide and holes/deep water at low tide with lots of sighting opportunities during both. Tarpon are in South Texas. They are large and they are plentiful. Tarpon are a whole other story, and deserve an article all to themselves, which is exactly what they are going to get. Tarpon are Larry’s passion and he has a lot to say in our forthcoming follow up interview. Larry is a proud and active member of the Lower Laguna Madre Fly Fishers Association. They have approximately 100 active members, and drool worthy photos on their website. While they are not aligned with the FFF they are very active in their community and provide outdoor and fishing days for children as well as casting and fly fishing lessons for the kiddoes. From the outside their site may not appear to be very active, but apparently that is because all the member are out fishing. With a fishery that provides nearly year round activity it is amazing anything gets done on this island paradise. I encourage you to contact the LLMFFA and get plugged into the action, meet some fellow fly fishers and get hooked up. And I hope you do. South Padre draws people for a variety of reasons, but the primary reason for this group of readers is the fly fishing. A stop at the Salty Fly Shop and a visit with Larry Haines will be the primary reason for a successful trip to the Lower Laguna Madre. So come on down, because I hear you are supposed to fish when the fish are feeding. is where the LagMomma’s hangout. There were tarpon at the North Jetty today, I saw 7 inluding two that I jumped while kayak trolling (shhhh, don’t tell) for SMacks and Kings. No they were not ladyfish, though there are plenty of those, here.